And now, folks, your seat belts (HA!) because I will try to make this post deep. How deep? Glad you asked. I’m going to take the recent discussion of what qualifies as superversive fiction and apply it to this movie. If you’re rolling on the floor in fits of laughter, I don’t blame you. But stick with me here. Just because something is lowbrow, doesn’t mean it can’t be superversive, at least in part. And if we can see superversive elements in this piece of schlock, maybe they would become easier to identify elsewhere. Thus, let the experiment begin! Aspiring/Inspiring. Our heroes are far from being role models, that’s for sure. But are they reaching for something higher? Are they attempting to improve the world, what little of it is in their control? 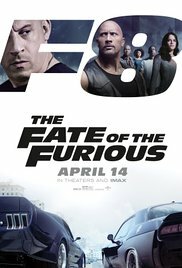 The opening segment includes a prolonged drag-racing sequence that ends with Dom Toretto acting with both generosity and honor towards a person who really deserves neither. Much later, when the villainess questions why Dom seemingly rewarded the man who tried to kill him, the response is, “I changed him.” Does it work like that in real life? Probably not. Thugs don’t choose to join the side of light because of one event, not commonly anyway. Is it possible? Yes, I suppose it is. Is it something we’d like to occasionally see in our art? Absolutely. Virtuous. I can see how this requirement can be viewed as problematic at first glance, but we need to remember that superversive heroes don’t need to be perfect. They do, however, need to know right from wrong, and more importantly, the story itself must be clear on the matter. An advantage of a well crafted dumb action movie is that the central conflict is very clear. The good guys are… maybe not all that good, not all of them, but they are working for a good cause. And the villainess Cipher, played with obvious delight by Charlize Theron, is as cold and vicious as they come. Her purported justification sounds vaguely noble from throwing around words like “accountability,” but at no point are we sympathetic or thinking, “Well, she’s kind of right…” Nope. Not even close. In this story, shades of gray are non-existent. Heroic. This one is easy. Unlike in some of the other entries in F&F franchise, the protagonists’ motives here are mostly pure: family, loyalty, honor and oh yeah, saving the world. There is revenge mixed in for some, and an opportunity for a second chance for others. In particular, Deckard (Jason Statham), a villain from one of the previous films, is at first hard to accept as one of the good guys, but he does redeem himself in one of the more spectacular and absurd scenes in a movie that’s full of them. In the end, they all rise to the occasion and do what they must to fight evil, no matter the cost. Additionally, in what to me is the stand-out moment of the movie, Letty bets her life, without hesitation, for a chance to reach and save her husband who appears to have gone rogue. It plays much better if you know the history of these characters, but it’s powerful in either case. Decisive. Again, easy, as per requirements of the genre. The protagonists don’t have time to agonize over their choices, in part because there aren’t too many. Saving the world is a non-negotiable goal. While there are heart-breaking scenes, we see not a hint of the modern “why me?” angst that has infected even many of the superhero movies. They hurt and they grieve, but never stop moving towards the goal. Non-subversive. You’d think a movie in a franchise built around essentially glorifying outlaws would be subversive by definition. Not so. This entry in particular has a villainess whose main intent is destruction of the current order, but there’s even more than that. In one of the obligatory Villain Exposition scenes, she’s intent on convincing Dom Toretto, the man who values family and faith, that he is wrong in his priorities. It’s not enough for her to use Dom’s skills. She has a need to destroy who he is, to prove that his life has no meaning, and by extension, no one’s life has meaning. This is an important point. If life is of no value, if family, faith and honor are but an illusion, then mass murder is a perfectly acceptable stepping stone to one’s goals. The villainess is a nearly perfect embodiment of subversion. She would not, in fact, be out of place in an old-fashioned fairly tale, from the time before our culture has developed a need to understand, justify, and sympathize with villains rather than to advocate and celebrate their unconditional defeat. There were other things that are remarkable on that front. For all the banter and joking around, there’s not a hint of irony when it comes to good old fashioned values. Dom talk constantly about family as if it’s some kind of magic mantra needed to pull him back to the light. (One reviewer commented that at times the movie has a feel of a GOP convention, with the word “family” being mentioned over 50 times.) They pause before a meal to say grace. Crosses figure prominently, both in the visuals and once actually in the plot. Two young hot-blooded men are courting an attractive woman, but that’s where it stays. There is no obligatory danger-inspired hookup, but on the flip side, no blanket rejection of men or romance either. It’s a small scene, fun and light-hearted, but also old-fashioned. And in the end, for all the ridiculous special effects and action, I think this is one of the reasons the franchise has endured. These movies entertain and amuse without tearing down, and they leave you, if not inspired, at least satisfied with a simple tale that shows the world working mostly as you know it should. Not so bad for a piece of dumb action after all. I admit, I started this book with a bit of trepidation. The Big Bad in the previous installment was so big and so bad and so near-indestructible that trying to top it could very well veer into the ridiculous (think some of the more unfortunate James Bond movies, for example). Wisely, the author didn't go that route. Oh sure, there's a worthy adversary for our favorite couple and their merry crew, but this novel is more concerned with adding more layers of plot and character development in between the 'splosions and bursts of machine gun fire. Yes, we get machine guns added to the mix this time, because, well, why not? The story starts off... angsty, for lack of a better word. Marco and Amanda are separated, causing much brooding for them and pain for the baddies. When those two brood, the soundtrack is more death metal than country, if you get my drift. 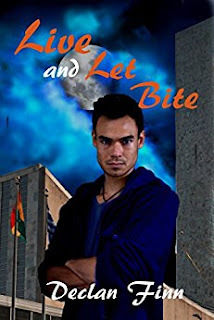 In the meantime, Merle the international man of supernatural mystery, discovers/confirms a connection between the U.N. and the vampires, both of whom, it so happens, want Marco dead at all costs. The rest of the plot revolves around our heroes facing and dealing with the new super-assassin, while trying to finally resolve their feelings for each other. If you guessed, "romance," congratulations! You're in for a treat. If not, and if your reaction is, "Oh no, not that!" rest assured that it's not your usual YA drama. These are serious people, with the fate of, if not the world, at least thousands of lives on their shoulders, who cannot function at full capacity till they address what is delicately called the issues of the heart. I'll give no spoilers in this regard since I consider this particular narrative thread the most suspenseful. Suffice it to say that there is a level of progress achieved, with hints of more to come. Stay tuned and wait for the sequel. It's that time of the year: the snow is melting, the new flowers are blooming, and the book awards season is coming into full swing. Unlike with the Oscars and other movie-oriented awards, where audiences tune in to see lavish dresses and occasional on-screen celebrity meltdowns, most of the book awards entertainment comes from--you guessed it--reading. Thus this week's roundup for your online entertainment. 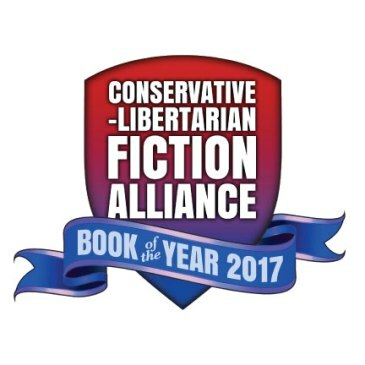 Conservative-Libertarian Fiction Alliance 2017 Book of the Year. The competition for this one was stiff, with the Top Two contenders vying for the lead until the final hours. In the end, Peter Grant claimed the first place with his Post-Civil War themed Western Brings the Lightning. John Ringo/Larry Correia collaboration Monster Hunter: Grunge came in second, and John C. Wright's wildly imaginative fantasy Iron Chamber of Memory rounded up the Top Three. For complete information on the award, full list of the finalists as well as the nature and goals of CLFA, please visit Conservative-Libertarian Fiction Alliance website. Second: The Hugo Awards finalists have been announced. I'm happy to see John C. Wright's excellent short story from God, Robot getting the nod, even if the environment surrounding this particular award is guaranteed to keep him from winning. The same comment applies to Jeffro Johnson and Castalia House blog, in their respective categories. If you're looking for more analysis, here is some from Declan Finn (I think the headline provides a hint of how he feels, but you may want to read the whole thing to be sure). Jon del Arroz crunches some vote numbers, for those who are into math. And finally, since I promised amusement, John C. Wright, in the comments on Vox Popoli blog, reacts to receiving the nomination. Kind of. 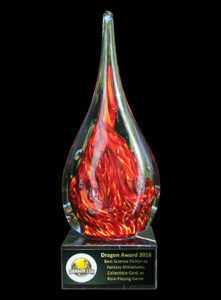 Third: The Dragon Awards nominations are open. Larry Correia provides this timely reminder as only he can. Personally, since the eligibility period for that one runs into the current year, I'm holding off a little longer. But there's no doubt that for sci-fi and fantasy fans, this is the award to watch (and for the authors, to strive to win). I guess this is a good time to mention that I will be going to Dragoncon this year, for the first time ever, and for some reason have been accepted as an Attending Pro. Soooo, if anyone has hints and tips, or wants to meet up, please comment below. Hope to see many of you there! Till then, as always, Happy reading!